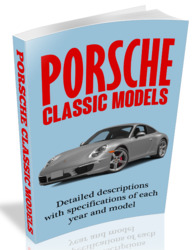 The elastic steering stop, 928.347.329.03, for left and right sides is replaces by a solid steering stop, 928.347.329.04, for improvement in quality. At the same time it was necessary to replace the dust cover, 928.347.191.02, with a new version dust cover having a supporting lip, Part No. 928.347.191.03. Only the new steering stop 928.347.329.04 and the new bellows 928.347.191.03 are supplied for steering gear 928.347.010.24. 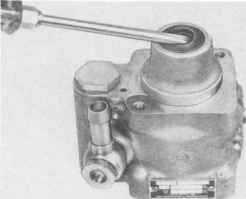 The bellows 928.347.191.03 and the steering stop 928.347.329.04 are also applicable to steering gears 928.347.010.26 / 928.347.010.27 (as of MY 91 or 928 GTS). The new steering stop may only be installed together with the new dust cover. When installing a solid stop for the first time, stops and dust covers must be replaced on both sides. The new version dust cover can also be installed together with the old version elastic stop. See cross reference survey on page 48 - 6d. 1. Detach intake hose to air cleaner on left side. Draw hydraulic fluid out of reservoir. 4. Remove rear bolt from power steering pump. 3. Loosen front bolts on power steering pump a little. 6. Take off left upper section of drive belt cover to facilitate procedures. 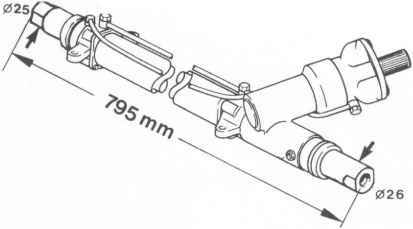 If hose is routed too close to exhaust manifold, the hose could come loose from its holder and cause failure of the power steering. Asbestos protected hoses are no longer available for replacements. 3. Install upper section of drive belt cover. 8. Remove suction hose after loosening clamp. 9. Remove bolts on front holder of power steering pump. Install this pressure hose leaving not mope than 25 mm between inner wheel well and hose. 1. 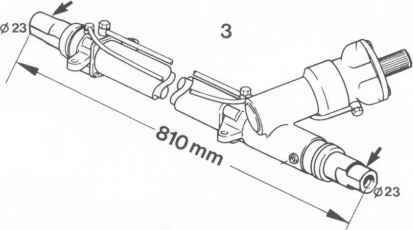 Tighten two bolts on front holder; only insert rear one (belt tightness). 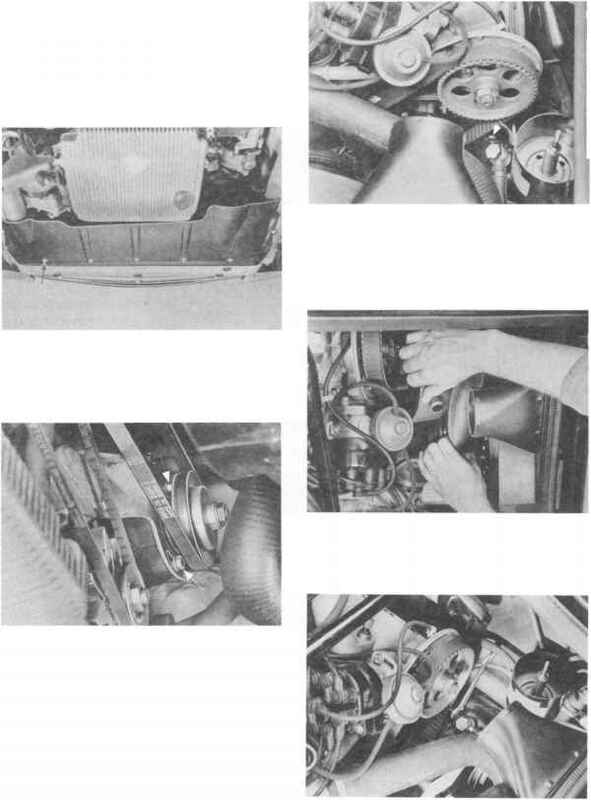 Pressure hoses in initially manufactured cars had an asbestos sleeve. 5. Install belt and adjust to remove tension. 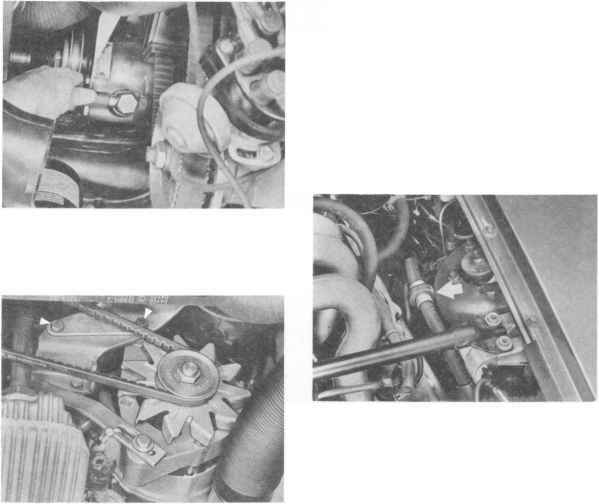 Also check tightness of alternator belt (slight corrections could be made). 6. Bolt on splash shield. Add hydraulic fluid. 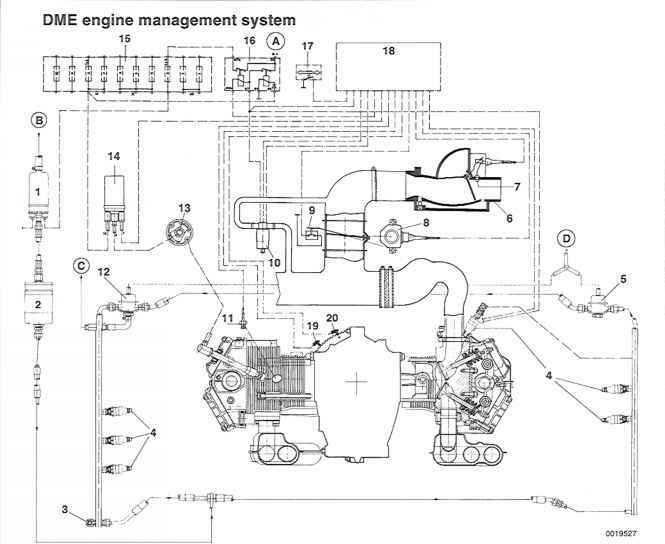 Bleed steering system. Check for leaks and operation. Make sure that no hydraulic fluid is spilled on alternator belt while disassembling and assembling. 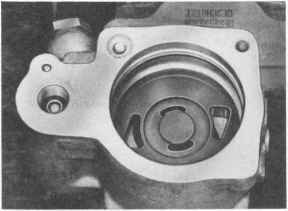 Body of power steering pump is made of aluminum as of 1981 models to reduce weight. Worn seals can be replaced on these aluminum power steering pumps, but pump has to be disassembled. 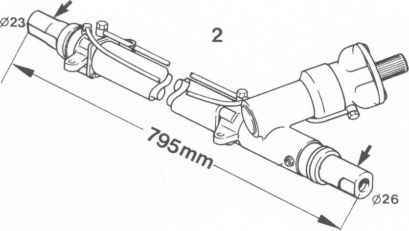 1, Use a standard puller (e. g. Kukko 20/1) to take pulley and woodruff key off removed pump. 3. Pull hook snap ring out of radial groove with pliers. Press down on cover during this step to prevent snap ring from popping up and causing injury. Do not cant cover while removing, to prevent damage to the sealing surface. 2. Remove front bracket on power pump. 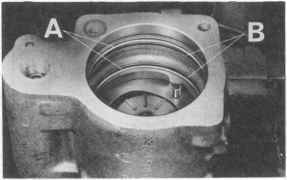 Pump may only be clamped in a vise on the marked surfaces (arrows) when replacing seals. Always use soft jaws in vise and keep clamping force as low as possible. Loosen a canted cover by removing deposits in cylinder opening and tapp lightly with a plastic hammer. If necessary, remove cover together with rotor set and face plates (step 4). 4. Drive out drive shaft with face plates and rotor Inspecting Components set by tapping with plastic hammer. Clean parts with a cleaning fluid and check visually. 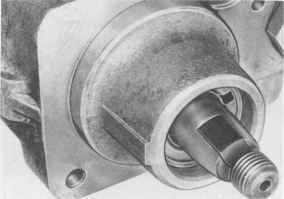 — Drive shaft: bearing surface of shaft seal and bearing sleeve (for wear). Threads, taper and groove for woodruff key. 5. Lift out shaft seal, being careful not to damage bearing surface and bearing sleeve. Remove support ring and O-ring in radial grooves of body (use plastic needle or air pressure). — Bearing surfaces and radial grooves of seals. Bores in body. — Sealing surface of cover. — Connection threads for pressure line. 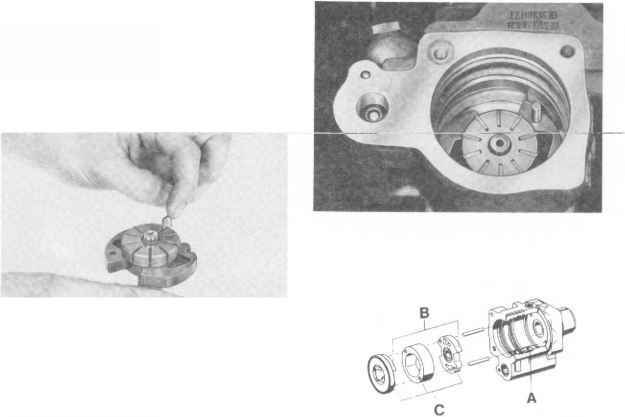 Cam ring (cam surface — seizure marks, wear) and rotor (guide slots — wear). Pump impellers (seizure marks and wear especially on round bearing surface and guiding surfaces on sides). — Face plates (seizure marks and wear on face surfaces}. 1. Insert dowel pins in body. 2. Install ten impellers in slots of rotor so that their polished and round outer surfaces face the cam ring. Make sure impellers move easily. 3. Install drive shaft, face plate and rotor assembly in body. Slide face plate on dowel pins with wide element opposite valve bore. Lubricate all parts lightly with ATF before installing. 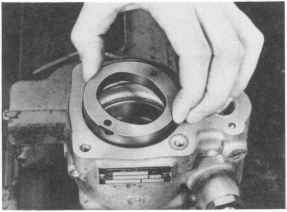 4, Install cam ring. Cast arrow in cam ring circumference indicates pump driving direction. Since the pump turns clockwise, arrow must be on cover end. There are elongated holes for the dowel pins in the cam ring and face plate. 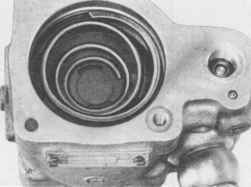 Elongated hole in cam ring must be aligned with elongated hole in face plate. 5. Place support and O-rings with small diameter in lower radial groove. Place support and O-rings with large diameter in center radial groove. Lubricate O-rings with ATF. 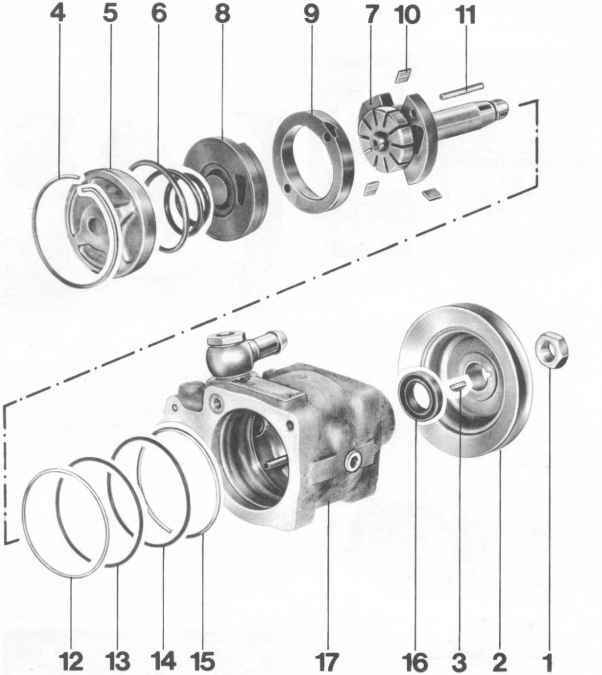 Check order of support and O-rings. Since March, 1983 or Pump Number 866201 the cover end support ring has been omitted (modified radial groove in case). 6. Press face plate on to rotor set. Dowel pins must engage in bores provided for this purpose. Slot must be aligned with slots in cam ring and face plate (wide section opposite valve bore). 7. Install spring with small diameter end facing face plate. 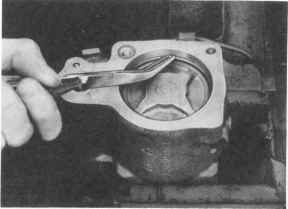 Press cover (with bevel facing inside of pump) into body without canting far enough, that hook snap ring can be installed (second mechanic required). 8. Pack mufti-purpose grease in shaft seal between both sealing lips and install seal on drive shaft. Use a suitable sleeve or cover woodruff key groove with a narrow strip of tape to avoid damaging shaft seal on groove. 10. Install front bracket. Install woodruff key and pulley. Tighten self-locking hexagon nut to 50 Nm (36 ftlb). 11. Install power pump Fill and bleed steering system. Check pump operation and for leaks. 9. 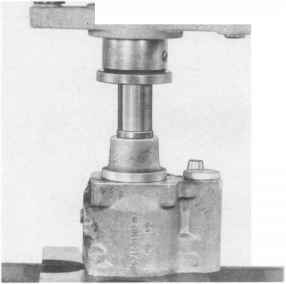 Press on shaft seal against stop with a suitable mandrel. 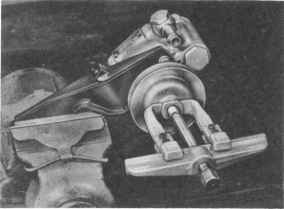 Did steering gears used to have asbestos?